ORANGE CITY, Fla.-- Hamlet is not your everyday pet. 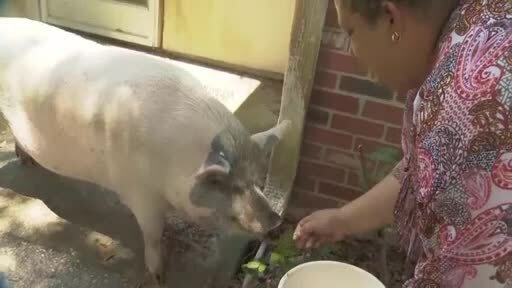 Stacey Fox says her 200-pound pig is a beloved member of her family. "He has run of the full house, plays with the dogs every day, gets into the pool every day." After meeting Hamlet, you can see how easy he is to love. But to Stacey he is much more than a pet; she says he saved her life. "I have Hamlet because I have bipolar and severe depression," Fox said. "One of the biggest ways he helps me out is when I can't get out of bed..he comes and lay in bed with me cause he is an indoor pig," she said. "We do not allow swine of any kind in any of our single-family residence classifications," said Orange City Manager Dale Arrington. But Arrington says officials are considering changing the rules after Fox presented them with extensive documentation of her need of Hamlet. She also cited the federal Fair Housing Act which prohibits discrimination against people with disabilities and in many cases allow for emotional support animals. "We didn't' have anything on our books in Orange City for how you handle formal requests for accommodation under the FFA, so we are currently in the process of amending our code," Arrington said. The proposed new ordinance must still be approved by the city council. But Fox is hopeful she'll get to keep her pig. "I can't even tell you how blessed we are for them to actually take this seriously was amazing to me." As for Hamlet. He's just ready to be left alone.